Gifts that compliment your Wedding Invitation Card, that too under INR 500! Wedding e-invites maybe the new age thing but there are many who still prefer to be old school and personally invite everyone. Usually a mithai ka dibba accompanies the wedding invitation. But have you thought of opting for a different route and yet remain in budget? I found 10+ gifts under 500 that go well with your wedding invitation cards! Indians are well known for their love for subhe ki chai and spices. Indian wedding pe Indian chai dena toh banta hai boss! Fancy shancy toh hum Indians ko bada pasand hai ji. Gourmet caramel popcorn is enough to tantalise your guest’s taste buds! You’ll be saving your guests from mummy ki chamat for leaving rings on the table by gifting them some really pretty coasters! By opting for handmade soaps you’ll be encouraging the artisans and also add a personal touch! 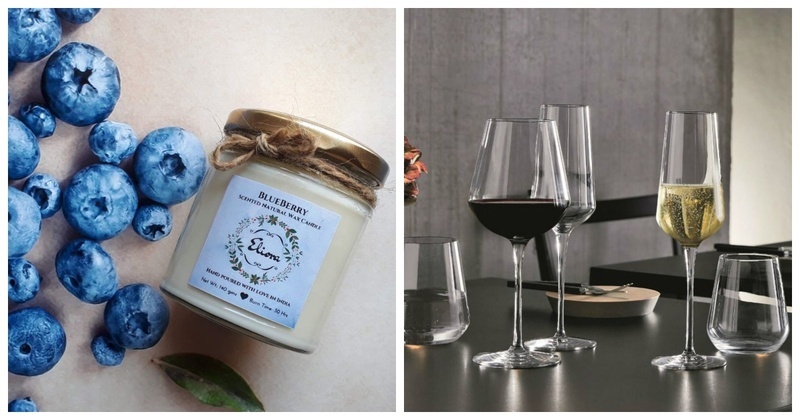 Scented candles have never gone out of fashion and make for a great gifting option! Novels have an old school charm, you can wrap a classic love story or any genre that you like! Dainty scarves with pretty patterns look chic and make a bold fashion statement! Yes, goodie baskets under 500 exist! A goodie basket will typically consist 2-3 items, diminishing your need to give more! The ever golden gifting option, photo frames will never disappoint your guests! Probably the most unconventional gifts of all, a chopping board will take your guests by surprise! Small wooden jewellery boxes look really beautiful and also make for a wonderful gift! Purchase wooden jewellery boxes here. Wine glasses are always classy and never trashy! You’ll easily get a pair under your budget. Pheew! Now you don’t have to spend a bomb only on the invitations!